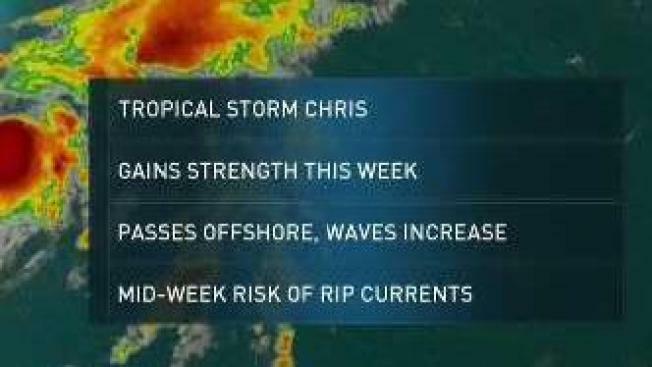 The third named storm of the Atlantic season formed early Saturday morning off the Carolina coast as Tropical Depression 3 has been upgraded to Tropical Storm Chris. The storm will meander off the Southeastern United States into the first part of the week, before finally moving northeastward. On its current track, the storm is expected pass well off the New England coast around Wednesday, likely as a hurricane. During the mid-week timeframe seas will build, with some of those waves reaching New England beaches. Be alert for an increased risk of rip currents during that time. A rip current, sometimes mistakenly called a riptide, can quickly sweep even strong swimmers away from shore. Never fight a rip current if caught in one. Instead let it carry you out, and then swim parallel to the coastline until you are free of it and can safely swim to shore.